Let's say you don't already ride a motorcycle. Or you know someone who's interested in riding. How much is it going to cost to get in the game? Thousands? Maybe a lot less than you think. Let me tell you about Sam. This is the story of a rookie rider. This is not the only way to get into bikes. It's definitely not the best way, but it's one of the cheapest "I got a bike!" stories I've been a party to over the years. If you see something cool in one of our videos that might not be real (like starships, light sabers, or Anthony turning into me), odds are pretty good that ol' Sammy had his fingers in that pie. Sam loves what he does. That's why he took a job here. Sam informed me when he started that he did not have a motorcycle, nor did he have any intention of getting a motorcycle. Like I'm gonna let that fly, right? I wore him down. Each day I'd ask Sam if he had purchased a motorcycle. He'd grin and tell me he didn't have the money. He had too many other hobbies to eat up his paychecks. I remained undeterred. I'd send him craigslist ads of good bikes. He'd politely look at the ads, then dutifully ignore them. One day I sent him a link, and he asked me to send it again because he'd lost it. The ad was for a 1980 Honda Twinstar 200. The fella selling it had a pretty fair asking price for this part of the country, at $825. It looked OK in the photos, and the owner said it ran well. I forgot about it, to be honest. I figured Sam was kicking tires. The next day, I found out Sam had already acquired his motorcycle permit. Apparently, the man was a bit more serious than I thought. Two days later, he asked me if I would help him go get it. I showed up to work with a truck and a ramp and a bunch of tie-downs, and Sam brought a big ol' wad of cheddar. It's basic to the point of being boring, but Sam swears it gets 893 miles to the gallon, and the price was juuuuust right. Photo by Lemmy. The bike was tip-top. The chain was adjusted and lubricated, the bike was clean, the brakes were adjusted correctly, and it didn't have any rash on it. It even had fresh tires! Everything was operable and appeared to be in good shape. I leaned close and told Sam that even if he paid the guy's asking price he'd be gettin' a good deal. Sam stuck to his guns, though, and got the guy down to $700. He forked over the bread while I fired up the little beastie. It started immediately — cold — and settled into a choke-less idle in under a minute. I blasted down the gravel driveway, and ran it through the gears. I returned and gave Sam a thumbs-up. That little bitty Twinstar was so small we had it in the bed of the truck before the seller came back out of his house with the title! Look at all that space! This job's got some great perks. It's quiet, has no traffic, and good pavement. It's a rookie's paradise! Photo by Lemmy. Fast-forward a few days. Sam has gotten his bike titled and plated and asked me for a crash course. 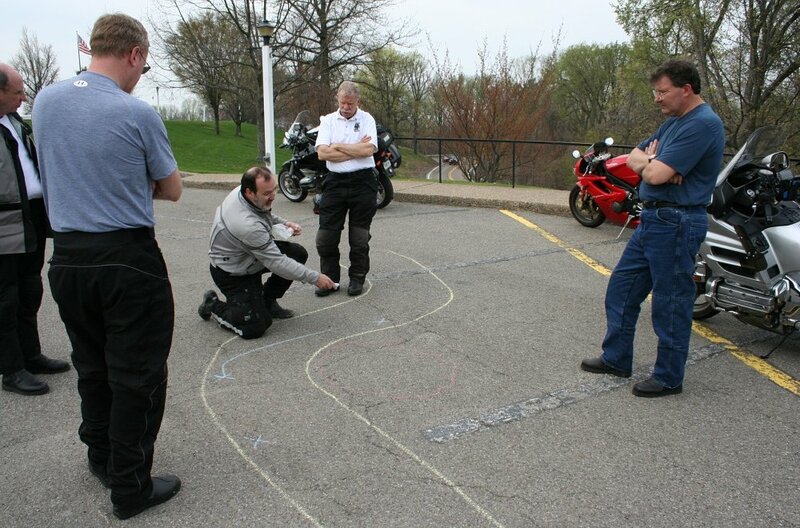 I'm certainly no MSF instructor, but I've gotten a few fellas onto a bike successfully enough. RevZilla is kind enough to give its people free rein of the parking lot, so we hunkered down one afternoon after work. We went through the controls, and then Sam felt as though he was ready to duck-walk around the lot, and then progressed to actually riding. At some point he let me know that he couldn't practice shifting because the lot was too small. I grabbed a bike, and we went for a short ride through the secluded complex where ZLA is located. Sam said he felt confident riding home, so he did, with me following. Sam practices his duck-walking to figure out exactly where in the lever travel the clutch begins to grab. Photo by Lemmy. Sam's been riding his bike to work most days. He called me recently because someone had vandalized his motorcycle. (They stole his spark plug boots. That's a common malady for city bikes. Druggies rip them off to use as a smoking pipe.) I asked him if he needed me to pick him up. Nope. He cobbled it back together enough to get it to work so we could assess it together. This was after he had pushed it for a mile. At this point, I'd say Sam's pretty well on his way to being a legitimate motorcyclist. Sam's story made me stop and think. I'm becoming a bit of a relic, but the way he started riding is not far from how I did it. Heck, a lot of older riders earned their stripes in a similar fashion. I know, these days everyone takes the MSF class, spends a fair amount of money on perfectly fitting gear and buys a more powerful bike. There's nothing wrong with any of that. Still, the cost can be intimidating for people who want to get their feet wet before they go whole-hog. I remember feeling discouraged when I started on the tight budget of a teenager. Sam's little motorcycle has four speeds, a kicker, and there's not a disc brake on it. It's small and slow. The second-hand Biltwell Gringo and RSD gloves he got from co-workers are very basic. He's riding around the city at low speeds. He had a buddy teach him how to ride and start wrenching on his scoot. It's so anachronistic it's nearly quaint, but he's unintentionally proving a point: This little hobby we all love so much can be simple and cheap. The barrier to entry is quite low, if expectations are also low. Including his gear, papers, and bike, Sam has spent under a thousand bucks. He definitely does not have the best of equipment, but he's got the bare minimum and a great attitude and he's out riding, while others are talking about how they plan to start riding as soon as they save up for their dream bike. If you're hesitant about becoming a motorcyclist, I'm hoping Sam's story is enough to bolster your confidence. Good job, Sam. I hope you grow to love riding as much as I do. It will make you a very rich man, regardless of your economic situation. And next time, spend a few more bucks, ya tightwad.